A new week has begun and trading will kick off soon. 1. Shell shock: Oil giant Royal Dutch Shell (RDSB) announced overnight that it would stop all offshore drilling in Alaska for the foreseeable future after a key exploration well did not yield sufficient amounts of oil and gas. The stoppage comes as oil prices trade around $45 per barrel -- a level that has squeezed profitability at oil producers around the world. Shares in Shell are trading sideways in Europe. 2. Stock market overview: U.S. stock futures are edging lower and European markets are taking a dip in early trading. Spain's IBEX 35 is the only index that's holding onto small gains. Investors may be relieved that parties campaigning for independence for the wealthy region of Catalonia failed to win a majority of votes cast in regional elections Sunday. They won a majority of seats in the regional parliament but ended up with just under 48% of the votes. That may make it harder for them to push ahead quickly with unilateral moves towards independence. Asian markets ended with mixed results. The standout performer of the day was the Shenzhen index in China, which jumped by 2.4%. On the flip side, the Nikkei 225 index in Japan declined by 1.3%. 3. Market movers -- SABMiller, Volkswagen, Glencore: Shares in SABMiller (SBMRY) are rising by 3% in London as investors hope that the world's largest beer brewer -- Anheuser-Busch InBev (AHBIF) -- is set to make a formal takeover offer for its competitor. If regulators allow a takeover of this size, it would be the biggest acquisition in the history of the beer industry, and one of the biggest in the world. Shares in Volkswagen (VLKAY) are heading south again -- down about 6% -- as investors continue to worry about the fallout from its emissions scandal. Shares in Glencore (GLNCY) are down by about 10% -- trading around their lowest level ever -- after the miner sold a nickel mine in Brazil for a disappointing price. 4. Weekly market recap: Last week was broadly negative in the U.S. markets. The Dow Jones industrial average dipped by 0.4%, the S&P 500 declined by 1.4% and the Nasdaq fell back by 2.9%. 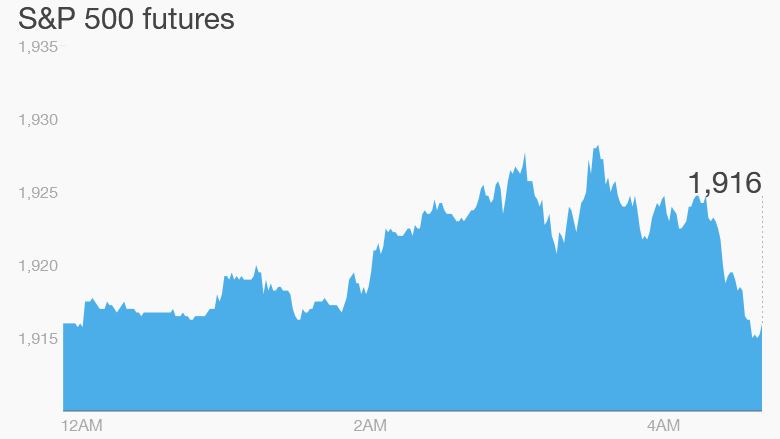 The Nasdaq has dropped by about 10% since hitting a recent peak in July.